Plants tightly cespitose, not rhizomatous. 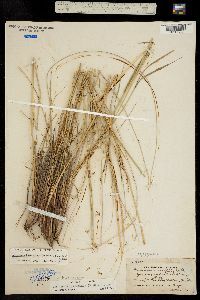 Culms 25-70 cm tall, 0.7-1.3 mm thick, glabrous or partly scabridulous; nodes 3-4. Sheaths glabrous or scabridulous, sometimes puber-ulent on the distal margins, hairs to 0.8 mm; collars glabrous, sometimes with tufts of hair on the sides, hairs to 1 mm; basal ligules 1.5-4 mm, hyaline, glabrous, acute; upper ligules to 2 mm; blades usually convolute, 0.1-1 mm in diameter, abaxial surfaces smooth or scabridulous, adaxial surfaces pubescent. 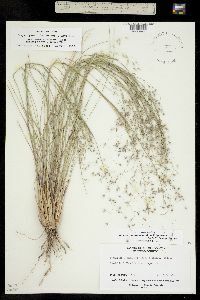 Panicles 9-20 cm long, 8-14 cm wide; branches ascending to strongly divergent, longest branches 3-15 cm; pedicels paired, conspicuously divaricate, shorter pedicels in each pair usually at least 1/2 as long as the longer pedicels. 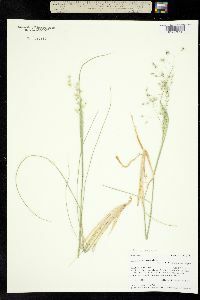 Glumes subequal, 5-9 mm long, 0.8-2 mm wide, saccate below, puberulent, hairs about 0.1 mm, tapering above midlength, apices acuminate; lower glumes 5-veined at the base, 3-veined at midlength; upper glumes 5-7-veined at the base; florets 3-4.5 mm long, 1-2 mm thick, obovoid; calluses 0.4-1 mm, sharp; lemmas indurate, densely and evenly pilose, hairs 2.5-6 mm, easily rubbed off, apices not lobed; awns 3-6 mm, rapidly deciduous, not geniculate, scabrous; paleas subequal to the lemmas in length and texture, glabrous, apices pinched; anthers 1.5-2 mm, penicillate, dehiscent, well-filled. Caryopses 2-3 mm. 2n = 46, 48. Achnatherum hymenoides grows in dry, well-drained soils, primarily in the western part of the Flora region and northern Mexico. Specimens from further east may be introduced; it is unknown whether they have persisted. The roots of A. hymenoides are often surrounded by a rhizosheath formed by mucilaginous secretions to which soil particles attach. 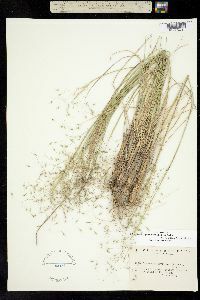 This rhizosheath harbors nitrogen-fixing organisms that probably contribute to the success of the species as a colonizer. Native Americans used the seeds of Achnatherum hymenoides for food. 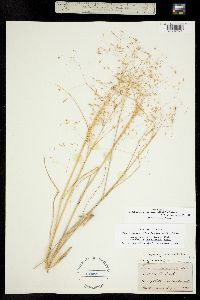 It is also one of the most palatable native grasses for livestock. 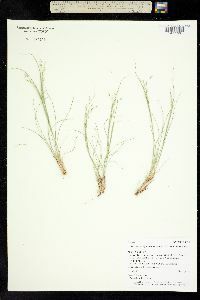 Several cultivars have been developed for use in restoration work, and it is becoming increasingly available for use as an ornamental. Achnatherum hymenoides forms natural hybrids with other members of the Stipeae. 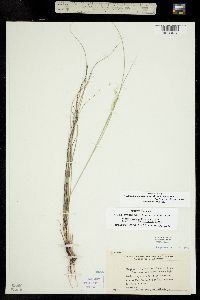 See discussion on hybrids involving A. hymenoides here. 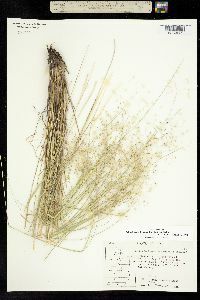 Perennials, Terrestrial, not aquatic, Stems nodes swollen or brittle, Stems erect or ascending, Stems caespitose, tufted, or clustered, Stems terete, round in cross section, or polygonal, Stem internodes hollow, Stems with inflorescence less than 1 m tall, Stems, culms, or scapes exceeding basal leaves, Leaves mostly basal, below middle of stem, Leaves mostly cauline, Leaves conspicuously 2-ranked, distichous, Leaves sheathing at base, Leaf sheath mostly open, or loose, Leaf sheath smooth, glabrous, Leaf sheath and blade differentiated, Leaf blades linear, Leaf blades very narrow or filiform, less than 2 mm wide, Leaf blade margins folded, involute, or conduplicate, Leaf blades mostly glabrous, Ligule present, Ligule an unfringed eciliate membrane, Inflorescence terminal, Inflorescence an open panicle, openly paniculate, branches spreading, Inflorescence solitary, with 1 spike, fascicle, glomerule, head, or cluster per stem or culm, Flowers bisexual, Spikelets pedicellate, Spikelets dorsally compressed or terete, Spikelet less than 3 mm wide, Spikelets with 1 fertile floret, Spikelets solitar y at rachis nodes, Spikelets all alike and fertille, Spikelets bisexual, Spikelets disarticulating above the glumes, glumes persistent, Spikelets disarticulating beneath or between the florets, Rachilla or pedicel glabrous, Glumes present, empty bracts, Glumes 2 clearly present, Glumes equal or subequal, Glumes equal to or longer than adjacent lemma, Glumes 4-7 nerved, Glume saccate, inflated, or flabellate, Lemma 5-7 nerved, Lemma body or surface hairy, Lemma apex acute or acuminate, Lemma distinctly awned, more than 2-3 mm, Lemma with 1 awn, Lemma awn less than 1 cm long, Lemma awned from tip, Lemma awns straight or curved to base, Lemma awn twisted, spirally coiled at base, like a corkscrew, Lemma margins inrolled, tightly covering palea and caryopsis, Lemma straight, Callus or base of lemma evidently hairy, Callus hairs shorter than lemma, Palea present, well developed, Palea membranous, hyaline, Palea about equal to lemma, Stamens 3, Styles 2-fid, deeply 2-branched, Sti gmas 2, Fruit - caryopsis, Caryopsis ellipsoid, longitudinally grooved, hilum long-linear. 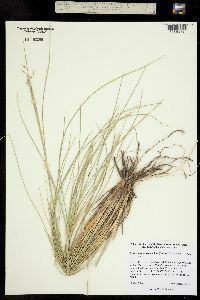 Densely tufted, 3-7 dm; ligules 2.5-7.5 mm, acuminate, becoming lacerate; blades numerous, smooth, strongly involute, ca 1 mm wide, nearly as long as the stems; panicle (5-)7-15(-19) cm, open, diffusely branched, with long-pedicellate spikelets; glumes ovate-acuminate or tapering to an awn to 2 mm, hyaline-margined, finely puberulent to subglabrous, the 3(5) nerves prominent toward the greenish glume-base, obscure in the anthocyanic distal part; first glume (4.5-)5-7.5(-8) mm, the second a bit shorter; lemma 2.5-4(-5), fusiform, turgid, maturing dark and shiny, densely white-pilose with long soft hairs ca = glumes; awn 3-5.5 mm, straight, readily deciduous; 2n=28, 48, 65, 130. Dry, open often very sandy places; Man. and nw. Minn. to B.C., s. to Calif. and Tex. (Achnatherum h.) Hybridizes with several spp. 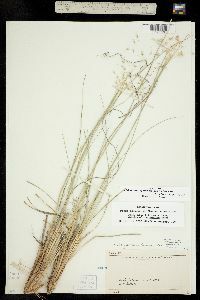 of Stipa, producing sterile plants called ؓtiporyzopsis bloomeri (Bol.) B. L. Johnson.